After getting his start in stand-up comedy, expert mimic Maurice LaMarche found lasting success as voiceover artist, working on a wide array of animated shows, including: The Looney Tunes Show (as Yosemite Sam), The Critic, The Simpsons, Pinky and the Brain, and Futurama, just to name a few. 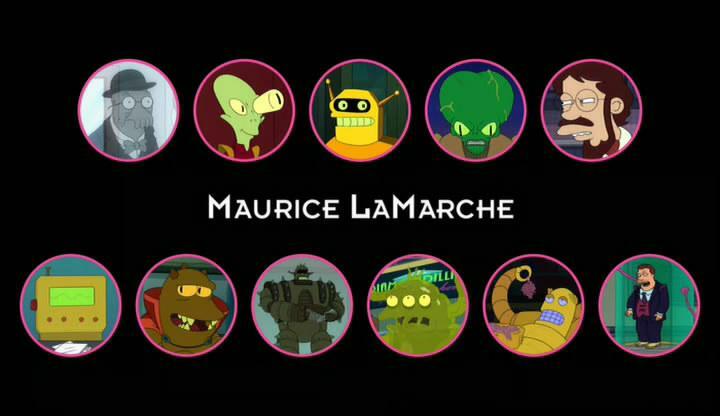 Since Futurama’s 2010 resurrection on Comedy Central, LaMarche has been busy voicing many of its most colorful and quirky characters, winning back-to-back Emmys for Outstanding Voice-Over Performance for his work on the show. Despite Futurama’s critical success and loyal fan base, Comedy Central recently announced that the show has not been renewed and its upcoming seventh season will be its last on the cable network. I recently spoke with LaMarche about his career, his characters, and his thoughts on the possible future of the series. Due to a scheduling mix-up, we got underway a bit later than anticipated, but LaMarche was amiable and instantly eager to chat. Pop-Break: I know that you got your start in stand-up, honing your skills as a mimic by featuring celebrity impressions in your act. How did you wind up making the move to voice acting from there, and which do you find more satisfying professionally: being in the spotlight as a comic or behind-the-scenes as a voice? But with my fifty five year-old head, I realize this is the best thing that possibly could have happened to me. No question, there’s an immediacy to stand-up comedy and any kind of performing in front of a live audience where you say something and you hear that sound, that beautiful cacophony of laughter when five hundred heads all laugh at the same time that you don’t get that in a recording studio. Even if you are funny, you look through the glass and it’s like watching this pantomime of laughter of the AD and the director and the producer and the engineer, but you don’t hear it. So that part I miss about standup comedy. But being given the opportunity I’ve been given in voiceover to play so many characters, to create with my voice – in collaboration of course with the writer and the producer – these distinct personalities, which are helped along by great art, that’s a singular experience that most actors don’t get to have. And to be able to do it with such great shows as Futurama and, in the past, Pinky and the Brain and The Critic, it’s an embarrassment of riches to use an overused phrase, but it’s true. How I got into it though was purely by coincidence. I literally tripped into it sideways. I wasn’t looking for it. I got one or two voiceover things back in Canada from a standup comedian at Yuk Yuk’s comedy club. I’d done two cartoons and didn’t do a voiceover again for seven years. It just happened that the voiceover agent from William Morris, to whom I was signed at the time for personal appearances because I was opening for people like Rodney Dangerfield, Kool and the Gang, and George Carlin, was in the audience at the Comedy Store. She said, “With all those impressions you do, you could do voiceover work. You could do a lot of cartoons. You could cross-pollinate characters. You could come up with your own characters. Would you like to go out?” She almost said, “Would you like to go out on auditions?,” like a Sadie Hawkins dance. She was asking me if I wanted to go do voiceover instead of me pursuing it. So it just kind of happened to me and I know that will really piss a lot of people off who are paying hundreds and hundreds of dollars for voiceover classes right now, but that’s how it happened, I can’t help it. PB: Well, you certainly have a talent. And as you mentioned, your impressions were what got you through the door. Those skills have also led you to fill in the roles of some beloved animated characters, including Yosemite Sam and Popeye. When you’re taking on an already established role, how much leeway, if any, do you have in making that character your own? ML: Well, I try as hard as possible to make it them. I actually have played two Sams as parts I’ve inherited from great performers – Toucan Sam, the spokescharacter for Froot Loops, I inherited from Paul Frees. Yosemite, of course, was Mel Blanc. But in both cases, I tried to stay as close to the original as possible because I remember being a little kid and when Barney Rubble’s voice changed, I didn’t know at five years old that there had been a terrible car accident and that Mel Blanc had been laid up and Daws Butler stepped into the role. I didn’t know any of that. I just knew that all of a sudden Barney sounded like Yogi Bear and I didn’t like it. When I took over Toucan Sam and Yosemite Sam, I was very conscious that I wanted the kids watching not to be jarred, not to have their little perception of cartoon reality jarred by my arrival on the scene. So I worked really, really hard. Over the time, of course, there is no such thing as an absolutely perfect impression, except of course for Craig Gass’ impression of Sam Kinison. But it slowly becomes your own and now I’m talking to young adults who tell me that I’m the Toucan Sam they grew up with. I’ve been doing Toucan Sam for twenty six years, actually longer than Paul Frees, the original, who did it for 24 years. I found a young man yesterday, a producer on the Lexus account where I do the voiceovers, who was saying, “You’ve been Toucan Sam longer than I’ve been alive.” (laughs) So basically little babies now have jobs, jobs that dictate to me. It’s very funny. PB: How does the experience of stepping in for an established character compare to creating your own from scratch and what is your process for doing that, for giving a new character a voice all your own? ML: Well, I love to do both. In one sense, I feel like I’m honoring a predecessor, a fallen hero if you will. Mel Blanc, Popeye, who was Jack Mercer, Toucan Sam, who was Paul Frees – were all people I listened to when I was a kid. So again, I’m very careful with it and it’s a great honor. I try to get a feel – it’s like a bumper sticker, “What Would Mel Blanc Do?” I try to make the choices he might make, I don’t make my own choices. 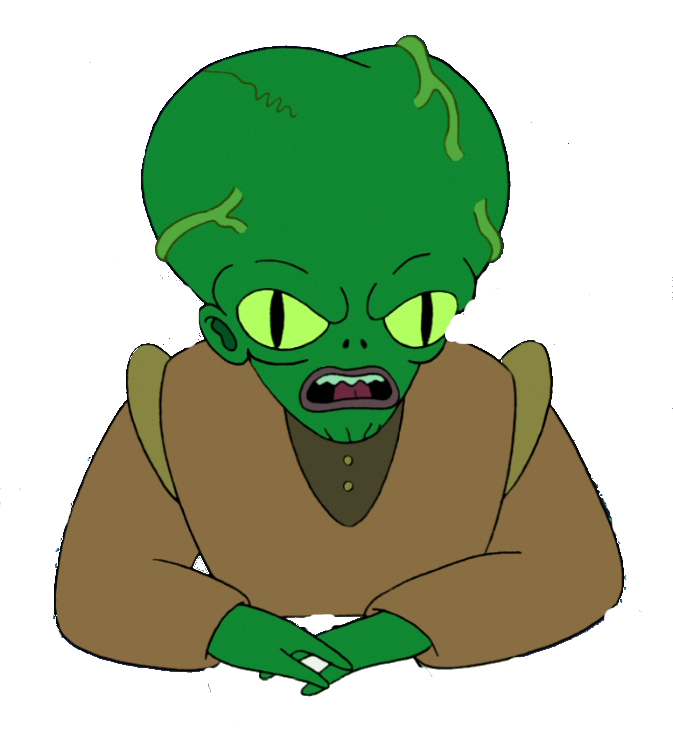 When I do a character like Kif Kroker from Futurama, in that case I’m completely free to access my inner nerd, my inner geek, my inner put-upon employee and just channel that. Because that’s who Kif is. Kif is every put-upon employee, put-upon spouse. The Kif sigh became a signature thing of him and we’ve all had to deal with an idiot in our life that has some power over us. In his case, Zapp. So I’m able to access that. With Lrrr, I’m able to go all out with all my mid-life crisis because now all the Lrrr, ruler of Omicron Persei 8, storylines on Futurama look into Lrrr going into mid-life. He’s had a little separation from his wife and we’ve got a wonderful episode coming up this summer about his relationship with his thirteen or fourteen year-old son. It’s all stuff that’s very rich for me in my own life. That’s where I am or have just been. It’s freer, when I’m doing my own characters. Part of my process finding those people is that I love to look at the model sheet, the official drawing of what the character is going to look like and how he’ll move, what he looks like when he laughs and try to inhabit it almost like a costume or a suit. I try to climb up inside of him. So with Lrrr, I knew he would have all this bluster and anger and energy and he’d just be big sounding. And yet he’d be a bit of a lout because he was king and no one ever talks back to him except his wife; people who get their own ways tend to be rather loutish. He’s like a giant, mean Fred Flintstone with scales, a little less lovable. So that’s part of my process. PB: You mentioned Kif, who’s your biggest role on Futurama. He started out as put-upon second fiddle to Zapp Brannigan, but has come more to the forefront as the series has progressed and has become sort-of an unlikely hero. How do you feel about his progression over the series? Do you feel that the writers were in part influenced by you and what you’ve done with the character since the beginning? ML: I can’t really speak to whatever affect my performance has had on the writers, but the writers will say frequently that they will almost have a symbiotic relationship with an actor and take on whatever the actor’s doing so that the actor becomes almost a co-creator of the part. I don’t know what I’ve done to lead them to believe that Kif could be this romantic hero, but he became a very romantic figure, almost Woody Allen-esque in his nebbishy love for Amy, and found in that love a lot of hidden ability to rise to the occasion that he might not normally have. He does things in service of his love for Amy that he would never do for the Nimbus or for Zapp. 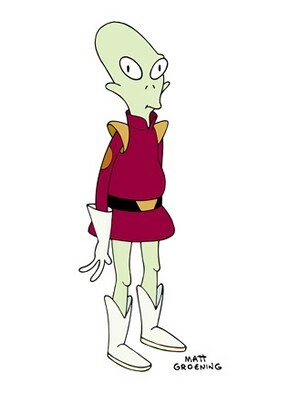 I don’t know if there’s something about me that triggered that in the writers or whether it was just like, “Let’s give Kif a love interest.” But he’s my favorite character, followed closely by Lrrr. I gotta love Lrrr, he won me an Emmy. But I’m probably closer in personality to Kif. PB: I was about to mention that you recently won an Emmy for your role on Futurama. I feel like you’re almost like the Hank Azaria of the show, in that you don’t really voice any of the leads, but a ton of the rich, ancillary characters that help make the world of New New York so fully realized. Of those, which would you say is your favorite? Morbo, Calculon, maybe my personal favorite, Hedonismbot? ML: Hedonism-who? (laughs) Well, I actually won (the Emmy), not to toot my own horn, two years in a row and I was more stunned with the second Emmy than I was with the first. The first one was like, “Oh my God, what a wonderful fluke!” But going into it the second year, I was like, “Since I know that was a fluke, I know I’m not winning this year.” And then, of course, double fluke. In the episode that they submitted for me in the second year, there were actually six characters on the slate, including Hedonismbot, Calculon, the Donbot and Clamps. I think even the HyperChicken was in there. 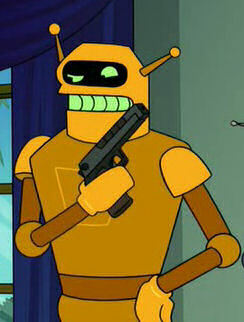 I would say Lrrr is my second favorite, but I actually have a soft spot for Calculon because he’s every actor. He’s the actor part of me that talks too much about myself, like I’m doing now. He’s kind of that narcissist bend, and yet he’s not essentially bad. In fact, he wishes he could be better. We have an episode confronting that coming up in the upcoming season. PB: That’s good to know. He was seemingly killed off last season, so I was hoping we’d be seeing Calculon again. ML: Seeeemingly killed off. Since David X. Cohen has already tipped off that we have a Calculon episode coming up and since in the Futurama universe anything can happen being that it’s science fiction and 1000 years in the future. There is an episode we call Calculon 2.0. So we get to revisit Calculon. PB: I’ve seen the first two episodes of this upcoming season and once again, I’m impressed with how consistently high the quality of the show has remained throughout the run. The second episode particularly really can hold its own with any classic Futurama episode. What would you say is your all-time favorite episode? ML: Oh my gosh, there’s so many good ones. “The Luck of the Fryrish” never fails to bring a tear to the eye. I have brothers, I know what that kind of love is like. There’s always a bit of conflict to it because it’s like a best friend you’d never pick for yourself and I love both my brothers very, very dearly. And “Jurassic Bark” – I’ve only been able to watch it once. I call it a favorite, but I can’t revisit it because I’m a mess. I was a mess at the end of the episode. I cried at the table read with the description of what was going to happen. I’m sitting there – and there’s no animation, we’re just reading the thing cool – and when David reads what happens when Seymour’s waiting at the – I can barely discuss it without crying (laughs). And oddly enough, those are my favorites and I’m barely in those episodes. In fact, I don’t even appear in “Luck of the Fryrish.” Those are my favorites and I think they’re big fan faves. Again, talking about the upcoming season, we’ve got a Zoidberg episode that will put that lump in your throat. It’s a really lovely episode about love. And speaking about Emmys, if Billy West doesn’t take home an Emmy for that episode, I’m going to be very surprised. It’s a great episode. You’re definitely in for a treat. Actually, we got a couple that will put a lump in your throat, including the finale. I think in many ways this will be our best season yet. PB: It’s certainly starting off strong. After seven seasons together, what’s your working relationship like with the rest of the cast? ML: Fabulous. We have a short hand with each other. We’re in a symbiosis, almost. We know each other’s characters so well that it becomes completely real. We don’t need the animation to make Bender real. John is Bender. When I have scenes where I’m interacting with Bender, I’m really interacting with John. We get along fantastically. We aren’t always constantly over each other’s houses or anything like that, but we socialize and see each other at other jobs and go grab a bite occasionally. We genuinely like each other and dig each other’s humor. It’s like a family and there’s some sadness that we won’t be having our biweekly reunions as much. Though I have to explain, I’ve always been the crazy optimist in the group through all of this. After our first cancellation, I said, “We’ll be back. I know we’re gonna come back somehow.” And then the four DVD movies came and I said, “I have a feeling we’ll be back.” And then we came back on Comedy Central for fifty two episodes. And now that they’re saying this is the end, I still have that feeling somehow that we’ll be back. It may take a little while. My running joke with Matt Groening is that we’re going to get ten seasons out of this. It just may take us until 2026. You never know. Somehow or another. PB: I was just going to ask you that. Given that the series has been resurrected before, and now with Netflix or even Kickstarter, there are certainly possibilities for it to return in some form or another. So you are hopeful that the series will find new life again? ML: In some form or another. Maybe it will be – and again, I’m not making any inside info predictions here. I have no idea – maybe there will be a big screen Futurama film. Maybe it will be webisodes. Or it might come back on Netflix. There’s so much fan support, there always has been, and that’s always put us in good stead. Who knows? Maybe even if our ratings are strong enough this summer, Comedy Central might say to us, “Awww, come on! Come on back!” We don’t know. But I just have that feeling that we aren’t done yet. And our finale episode is one of those that could be the ending or could be the beginning. It could be a gateway to further episodes, but we don’t know. I’ll leave it as cryptic as that because I don’t want to tip anything off. PB: Well, I’m hoping you are correct and that there is a future beyond this season. Which brings me to my last question, can you give us a little preview, like you’ve been sprinkling through the interview, of what we can expect in the upcoming and hopefully not final season of Futurama? ML: Let me think here. That’s really more David Cohen’s job than mine, I have to say. So I wouldn’t like to say much more than I’ve said, other than what we’ve got coming down the pipe is some of the strongest writing we’ve had and it’s going to be a real big treat. The previews I’ve given you are the episodes I know the most about and you’re going to love them.